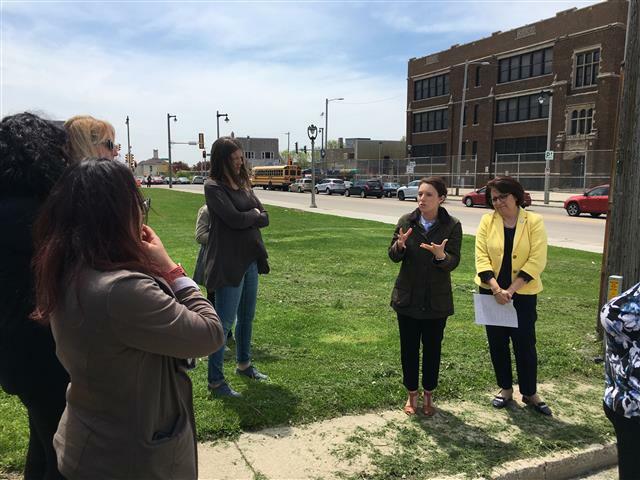 PLACE Consulting recently had the pleasure of continuing its work with Loyola University Chicago and the RogersEdge District by leading a site visit to Milwaukee. PLACE’s 2015 development study for the university helped to create the RogersEdge district, located between the two distinct communities of Rogers Park and Edgewater, which focuses on joint branding and aligned development in an otherwise underperforming part of each community. Upon the study's completion, Loyola decided to further invest in customized site visits to learn best practices and innovative ways to spur on economic development around the university. Prevous site visits were conducted in New York City and New Orleans. This year, PLACE took representatives from the Rogers Park Business Alliance, Loyola University and the Edgewater Chamber of Commerce to Milwaukee. Each sent delegates on the site visits to learn from top-notch Milwaukee organizations. Milwaukee's Historic Third Ward is in a district similar to Chicago’s West Loop or NYC’s Meatpacking District and has experienced rapid growth in the last decade. The "Third Ward" is comprised of three organizations working together: BID No. 2, the Historic Third Ward Assocation and the Architectural Review Board. Staff from these organizations provided insight as to how the Third Ward engages in business development and placemaking, while preserving the character and authenticity derived from its proud past. Menomonee Valley Partners (MVP) has transformed the Valley in Milwaukee into a national model for economic development and environmental sustainability. Once a site for heavy industrial uses and highly contaminated, it is now home to 5,000 jobs and 47 companies. Thanks to MVP, the Valley is now thriving and attractive, and their model is one that areas across the country can use as a guide for improvement. The King Drive Business Improvement District (BID) excels at cultivating a district in which new development is continuous, as well as authentic. Most recently, the BID brought Pete’s Fruit Market, a new affordable and healthy grocery store, to the area to ensure access to fresh food for all residents, and the grocery store was honored with a MANDI award from LISC Milwaukee. New housing and commercial development is also in the works, in conjunction with a new Transit-Oriented Development plan. Lastly, the BID has adopted a public park that it will be renovating and programing to create a safe and enjoyable space for the community to call its own. The area is on the edge of the new Bucks Arena, and executive director Deshea Agee is committed to keeping King Drive a thriving neighborhood that all people can enjoy. Focused on increasing the vitality of the Near West Side in Milwaukee, Near West Side Partners (NWSP) was founded and is supported by five major institutions, including Marquette University, Aurora Healthcare and Harley-Davidson. NWSP is a multi-issue organization that works in seven neighborhoods and oversees a BID that recently renewed and expanded. NWSP offers insight into what can be achieved when anchor institutions collectively invest and collaboratively work toward common goals. The Layton Boulevard West Neighbors organization concentrates on revitalization efforts in three South Side neighborhoods: Layton Park, Silver City and Burnham Park. The organization was founded and is supported by the School Sisters of St. Francis and focuses on business and economic development, safety, social cohesion and community engagement, taking its direction from the community through regular community conversations about priorities and strategies and a community-based board. They recently won a MANDI award from LISC Milwaukee for their work in low-cost block club activities and improvements. Make No Little Plans – and, don’t put them on a shelf! Who’s Afraid of a Little Cold Weather?